“Do you like pork?” The question comes from Sarah Holway, whom I have phoned to learn more about the Federal house she recently rehabilitated in Waterford, Virginia, about 45 miles northwest of Washington, D.C. My thoughts are on bricks and mortar, but she steers the conversation to food. It’s only fitting, because food originally led Holway, an advocate for school gardens, to Waterford. And her philosophies about food offer key insights into her approach to historic preservation, as I discover during a visit two weeks later. Northern Virginia is still digging out after last January’s record snowstorm when I step onto Holway’s porch and knock on the front door of her three-story, red brick house, built in 1800. She greets me in a pair of faded jeans and wool socks. I kick off my boots and follow her down a long entry hall, the warmth and savory smells growing stronger with each step. “We were just having a bowl of stew,” Holway says, introducing me to her neighbor, Jonathan Daniel, who is balancing plate and bowl on his lap, sunk in a plush, cornflower blue chair. Against my protests, he stands to greet me. As Holway ladles stew into a bowl for me, Daniel tosses another log on the crackling fire. 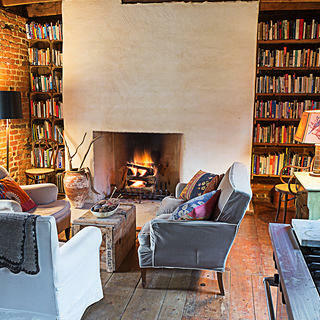 On either side of the fireplace, built-in bookshelves rise from floor to ceiling. Holway, I later learn, made the stew using sweet potatoes, lentils, onion, and pork sausage from a local farm, which she supports by buying into the farm’s community-supported agriculture (CSA) program. I slather her homemade bread with butter and dip it into the hearty stew. Within 10 minutes of my arrival, I feel at home. 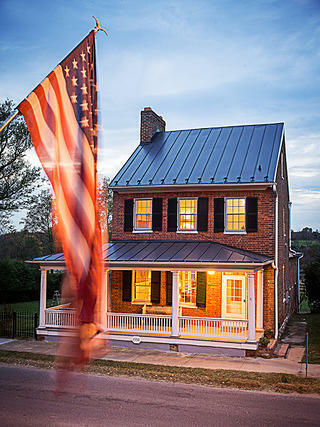 That simple word—home—with all its profound implications, is a crucial but often overlooked component of historic preservation. Given all the technicalities, rules and regulations, financial challenges, and advanced levels of expertise and craft required, it’s easy to lose sight of how preservation makes us feel, of what compels us in the first place to occupy and care for old buildings. A few years ago, something in Holway hungered for home. She found what she was looking for in a rare, almost wholly preserved historic village of about 120 houses and buildings surrounded by rolling farmland. “Living here in Waterford in this house, it feels like this is what I’ve been waiting for,” Holway says. Holway’s rehabilitated Federal house in Waterford, Virginia. The house’s reconstructed back porch. 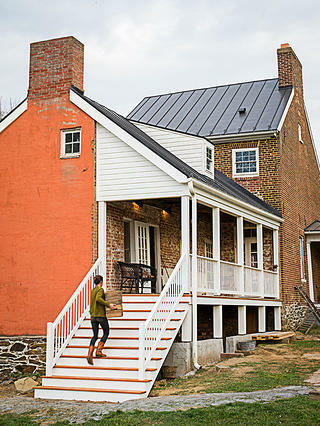 In 2014, Holway made the bold decision to leave D.C., where she still works full time, and buy a fixer-upper at the far western reaches of commuterdom. Although she didn’t know a soul in Waterford, she had befriended the owners of Moutoux Orchards, 6 miles from town. She’d leave work on Friday, drive 40 miles for her weekly box of food, and often stay for dinner. She began exploring options for moving to the area in order to more fully live her values—which brings us back to food. Five years later, Holway longed for a slower pace and closer proximity to the farms that had become her primary food source. The first time she pulled into Waterford, with its dense cluster of 18th- and 19th-century homes and shopfronts, towering mill, forge, Quaker meeting house, and one-room schoolhouse, she fell in love. “It’s something you want to be a part of,” says John Souders, whose similar love-at-first-sight experience four decades ago inspired him and his wife, Bronwen, to buy a farmhouse on the edge of town. Together, they act as Waterford’s unofficial historians. “It’s a historic village with a hard edge where the farmland starts,” he continues. “There’s no sprawl. There are no gas stations, nothing ‘commercial.’ It’s a survivor, and it’s remarkable.” As a result of its pristine condition, Waterford is one of only a handful of villages recognized as National Historic Landmarks. Holway bought one of the last un-rehabilitated houses in the village. Intermittently occupied for several years, the 2,000-square-foot house on Second Street (there is no Third Street) had been poorly remodeled by a previous owner, who replaced most of the original windows with cheap vinyl sashes and covered the plaster walls and ceilings with drywall tacked to furring strips. Holway closed on the house at the tail end of 2014—champing at the bit to peel back the layers of accretion and find out what had survived the centuries, but “feeling an overwhelming sense of responsibility not to destroy anything important,” she says. 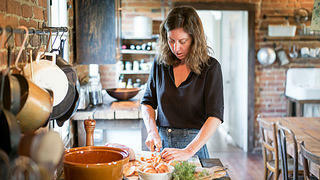 Holway, cofounder of a Washington, D.C., food policy nonprofit, prepares a meal in her kitchen. 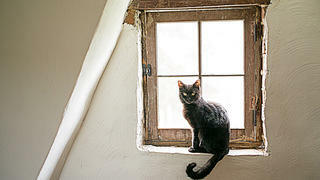 Holway’s cat, Rumble, sits in an original casement window in the attic’s gable. For help with her Waterford house, which required far more than rearranging, Holway turned to local builder Chris Howlett, a skilled and sensitive craftsman who took equal pleasure in the historic puzzle. Poking around the exterior on day one, Howlett let his eyes wander up the tall brick wall at the rear of the house and noticed a chimney jutting from the ridgeline. Back inside, hidden behind the drywall, he discovered an ancient cooking hearth. Digging in its rubble, he found part of an old hand-wrought iron crane that would have held stew pots. (An iron replica, fashioned by a local craftsman, hangs in the newly exposed fireplace.) Holway remembers the thrill of discovery. “It was so exciting having all these rooms and not knowing what we would find,” she says. The rooms were full of fireplaces, it turned out. All except one had been stripped of their mantels and sealed. 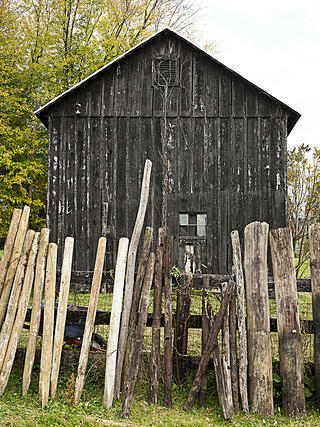 In a small barn behind the house, Holway found the original wooden mantels, dust-caked but intact. And she pulled more treasures from the dark, cobwebby recesses—an old ammunition crate, which now serves as a bathroom medicine cabinet; heaps of hardwood lumber, which Howlett used for flooring and a kitchen counter; and a weathered milking stanchion Holway cleaned up and artfully mounted on the living room wall. She calls the outbuilding “The Giving Barn,” after Shel Silverstein’s book The Giving Tree. After removing the dropped ceilings and unsalvageable lath-and-plaster, Holway and Howlett discovered several broad, hand-hewn beams, one as long as 40 feet, supporting second-story floor joists. Out of budgetary necessity, she left the rich, honeyed wood exposed, one of many aesthetic touches that give the home its charm. She, or some future owner, can always add plaster to match the original ceiling. The previous owner had removed all but three of the original windows. Luckily, the remaining ones include the two ground-level, nine-over-six double-hung windows along the front facade. 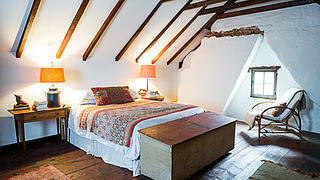 The third is a small, four-light casement in the attic’s gable end. So far, Holway hasn’t had the budget to commission historically accurate replacements for the dozen vinyl windows, but she replaced five with period windows she found at an architectural salvage shop in Front Royal, Virginia. They’re not exact matches, but they’ll do just fine. One of two late-18th-century barns on the property. 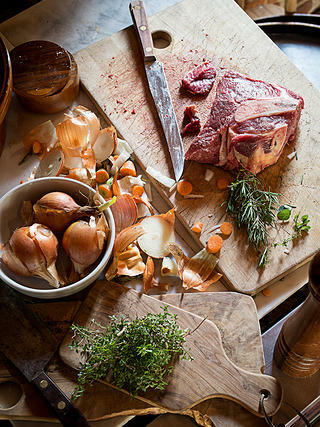 In Holway’s kitchen, the ingredients for a beef stew. Now that she’s done with her rehabilitation—as done as any preservationist ever is—Holway’s house is a gorgeous reflection of her personality. Since discovering Waterford during her Friday farm runs, Holway has learned that historic preservation, like locally raised food, can be a force that nurtures individuals and knits together communities. There’s more to it than bricks and mortar. At its core, preservation is about connection, community, generosity of spirit. What Holway lacks in technical training as a preservationist, she makes up for in her ability to tap into the power of place. Home and food both enrich her life.